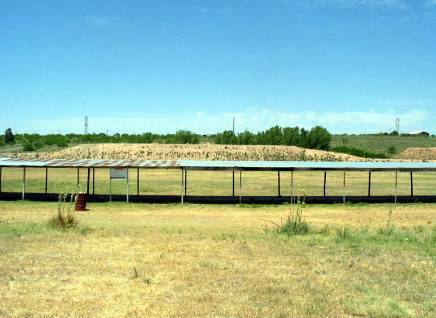 The Club’s Smallbore Prone Range is the first range visible from Western Street as one enters the Club property. It is located just north of the Indoor Range building. All outdoor Smallbore Prone and Position matches are held on this range, as well as the occasional reduced course CMP Garand and Service Rifle matches offered by the Club. Additionally, there are several concrete benches at the east end of this range for casual use by members and their guests when a scheduled match is being held on the Benchrest Range. Targets and target frames for this range are housed in the green boxcar between the firing line and the Indoor Range. All Club and Range rules apply. Smallbore (rimfire) competition is normally conducted from the prone position at 50 and 100 yards. Casual shooting of smallbore rifles may likewise be done from prone at smallbore targets at 50 and 100 yards. Centerfire rifles must be used with Benchrest-type target frames (wider than the smallbore target frames) set in portable bases at 100 yards only. Position shooting (standing, kneeling, sitting, or prone) of both centerfire and smallbore rifles is permitted on this range at Benchrest targets set at 100 yards only.